It’s a hat trick: HARTING Applied Technologies has won the “Excellence in Production” competition in the “Internal tool manufacturing under 50 employees” category for the third time. The company previously won in the same category in 2014 and 2016. 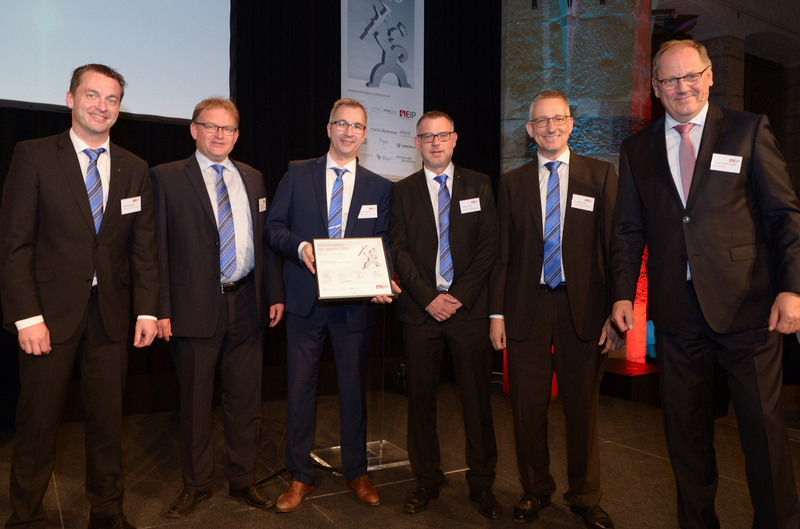 Led by Managing Director Dr. Volker Franke and Rainer Hussmann, Head of tool manufacturing, the team went to Aachen to receive the award. Around 250 guests assembled for the award ceremony in the Coronation Hall in Aachen. The Fraunhof Institute for Production Technology (IPT) and the Toll Machine Lab (WZL) at RWTH Aachen chose the winning tool manufacturers from a field of 311 across four categories. “This award was won by all the hard work put in by the people in our company who make leading-edge products. I am delighted that we have come out on top in this prestigious competition again,” said Dr. Volker Franke, Managing Director, HARTING Applied Technologies. HARTING Applied Technologies is an acknowledged specialist in the field of tool manufacturing. Part of the HARTING Technology Group, the company develops, builds and manufactures precision injection moulding dies, die casting tools and stamping and bending tools for the electronics and automobile industries. Applications for products from HARTING Applied Technologies range from large housing components for connectors in plastic and aluminium to micro injection moulding components with a very high finish quality. The HARTING Applied Technologies team were delighted with the new accolade: Cord Speckmeier, Reiner Hußmann, Thomas Heimann, Andreas Weiß and Managing Director Dr. Volker Franke (from left to right). Extreme right laudator Dr.-Ing. Rolf-A. Schmidt (Benteler Rothrist AG).